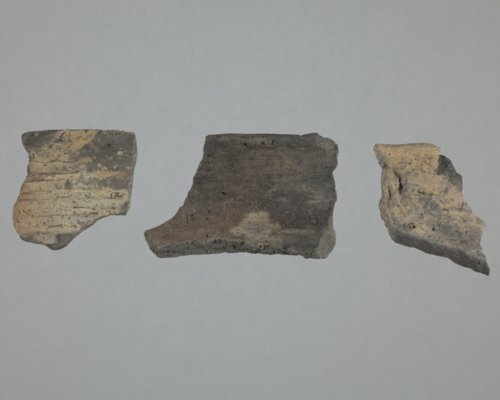 These three rim sherds were collected from the Wullscheleger site in Marshall County and donated in 1960 and 1961 to the Kansas Historical Society. All three of the out-curving rim sherds have sand temper. The sherds are from three separate vessels, have horizontal lines on their necks that are representative of three distinct techniques (from left to right): parallel tool trails, fine tool trails, faint or smoothed-over tool trails. The site was occupied periodically throughout the Early, Middle and Late Ceramic periods, though this pottery may be more typical of the Middle to Late Ceramic periods.